92% of companies recognize the value of ABM and see an effective ABM strategy as a “must have” for B2B marketing. You have the perfect solution for a company and you’ve presented a great demo to a contact within that company. Now you have to rely on that contact to resell your product within their company to all their decision makes. In fact, according to CEB, 5.4 people have to formally authorized each decision. 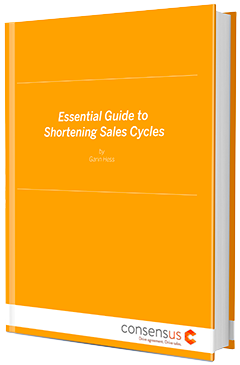 This makes sales cycles longer and lowers sales conversion. What makes this an even bigger challenge, is that CEBresearch has found purchases from a vendor who tailors content to a specific buyers needs are 40% more likely to happen and that “Better tailoring of content” was identified as a priority by 95% of CMO’s facilitating a purchase. How are you supposed to tailor your demo to an organization with different decision makers with different priorities. Consensus provides an account based marketing solution that allows customization for each decision maker and will let them prioritize what is important to them. We also provide detailed Demolytics that provide you important information on who is seeing your demo, how long they spent viewing it, what is important to them, what isn’t important to them, and who they shared the demo with. Consensus has increased close conversions of our clients by 44% and decreased sales cycles. Instead of bogging down your live sales conversations with repetitive and generic product information, an Intelligent Automated Demo gives each decision maker a personalized demo experience that is custom made for what interests them, helping you spend less time doing demos and more time having closing conversations. Any salesperson that works with mid-market or enterprise clients knows the pain of a long sales cycle. When decisions are being made that will impact a company for months or even years down the road, there is a level of review that must be performed in order to feel comfortable with a purchase decision. In this guide, we’ll discuss the typical barriers a salesperson will encounter and how automated intelligent demos can help mitigate, and in some cases overcome them entirely. “Where do I start?” is one of the most common questions asked about the sales tech stack. Building the right stack seems daunting, risky, expensive, and too complex. There are so many things to consider. This ebook will help you begin managing your tech stack with purpose, in an agile way that gets results. Read the full ebook to learn how to simplify the challenge of choosing technology that will help your sales teams become more efficient and successful.